Client question: I’ve looked through some of the material you sent my way and I will be definitely be there on that date. Fair warning, I think it is only rational and responsible for any person to practice skepticism when approaching a new technique, method, diagnostic tool, treatment, (the list goes on and on) so while I look forward to our meeting I hope you won’t be offended by that. (Which isn’t to say that I’ll be combative, rude, or close minded in any way shape or form.) The table you sent along seemed very detailed, but when I checked your program against FDA approved biofeedback (applications?) NeurOptimal occupied a weird category–most were either yes, followed by a designation, or a simple NO–whereas your system (as far as I could tell with very limited research) seemed to fall into a third unknown category, and I was wondering if you could tell me a little more about that just to get me started in the right direction. Answer: I admire your scientific rigor and healthy skepticism is needed in today’s world. So long as you keep an open mind and are willing to have the experience, that is good enough. I have plenty of healthy skepticism! But rest assured, the science that underpins NeurOptimal neurofeedback is current, impeccable, and as you will see, it delivers what it promises. Since our brains (CNS) are complex adaptive systems, NeurOptimal is capable of comprehensively providing the brain with information about its own perturbation (root is perturb) and help it do what is does best; conserve energy and solve problems and meet challenges in the present. This translates into many benefits which you Dad may have shared. The FDA has grandfathered eeg brain biofeedback and we fall under this unbrella. We are a training approach and thus do not diagnose, treat, or use protocols, as do the rest of the field of neurofeedback. Dr Val Brown, the brain behind NeurOptimal has owned, operated, been certified and taught virtually every biofeedback and neurofeedback approach in the field and has brought neurofeedback into the 21st century, the Quantum age with non-linear, dynamical physics and math. It is completely non-invasive so it will likely be a relaxing experience your first visit, helping your brain stop doing things that it is doing that are not necessary and not forwarding your life. I can explain more when we meet. Looking forward to our meeting. “I have chronic depression also known as dysthymia, it was brought on by stressors in life and it feels as if my brain has adopted this mind state as it’s ‘normal’ state. I am on a course of neurofeedback that doesn’t appear to be working (8 sessions). I had a QEEG (brainwave analysis) done and it came back as excessive beta in the cp4 and p4 regions of my head, which is normally present in anxiety which I can strongly relate to, the practitioner is obviously training these regions. I am considering training with the Zengar NeurOPTIMAL system as it appears fundamentally different in that it works on a more subconscious level and appears more natural. My brain/cns seems to have adopted this mind state as my normal state of mind. How is it possible for the brain to work with the system to self-correct my problems? I understand the system detects ‘turbulance’ in the cns, however how does the brain know how to positively correct itself when given the ‘turbulance’ feedback? Also, how could the NeurOPTIMAL help me, considering my problem areas are at different areas of the brain then where the electrodes are placed”? Other neurofeedback approaches train individual sites in the brain and thus have to diagnose (which is expensive as you found out) and then push, pull, or prod your brain in certain directions and in certain frequencies that your practitioner determines as appropriate for your condition. But of course, then side effects tell them how to proceed. NeurOPTIMAL is an entirely unique approach with the exact same biofeedback technology that was developed over the past 50 plus years. We are essentially working with your brain in a non-linear way (it lives on the edge of chaos and order), and so we listen all brainwave frequencies comprehensively, across the entire spectrum. 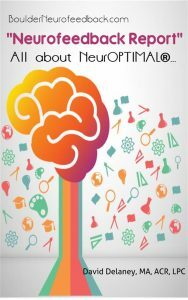 Our brain/CNS is one unitary system, not a bunch of different and disconnected regions in the brain and this we know now based on solid research over the past 15 years. One brain, one CNS being trained comprehensively, moment to moment. We are able to listen to 96% of all brainwaves from 2 locations on your head known as the C 3 and C4 points or Limbic Crossover. Our system targets dysfunctional brainwave patterns called perturbation (the root being ‘perturb’) and this turbulance that your brain is ‘generating’, which makes you feel anxious, causes the music that you are listening to be interrupted. It is the interruption that informs your brain/CNS, in its own language, about what it just did. And since your brain is designed to function at a ever higher rate of resiliency and effectiveness for survival. it learns from direct experience and re-organizes how it using its energy. This is what we have discovered in the last 15 years and is the most important discovery since we learned that the Earth is not at the Center of our Universe (which was only 400 years ago, by the way). Our brains are the most sophisticated organic computers we could ever imagine. Perturbation is the precursor of depression, anxiety, focus issues, ADD/ADHD patterns, poor performance, learning issues, precedes trauma and PTSD memroys to name only a few. There are many patterns of overload in the human nervous system and the way we work, your brain can reorganize it is gernerating suffering events itself because that it how it is designed; self-correcting, self-regulating, self-organizing. The brain/CNS is an instinctual system for adaptability and you would not be alive if it were not this highly sophisticated and completely adaptable moment to moment, answering the question ‘where am I’ or ‘what is different about this moment’. I hope this helps you better understand what all the other systems are doing and what we do.